Yesterday, in the neighborhood bagel shop, I stood behind a scruffy young guy who was buying breakfast for himself and two young women. It was simple fare — bagels, assorted toppings and coffee — and it came to $16.37. He didn't have the cash, so he gave the cashier his debit card. Declined. Part of me of course felt awful for him; in all likelihood, his dating prospects had now dimmed dramatically. But it also occurred to me that whatever state of intense denial the young man was living in is connected to what got our economy into all this trouble. Most of us like to treat our friends to a meal once in a while, but there comes a point when enough is enough. And when you are too tapped out to scrape together $16.37, you have reached that point. 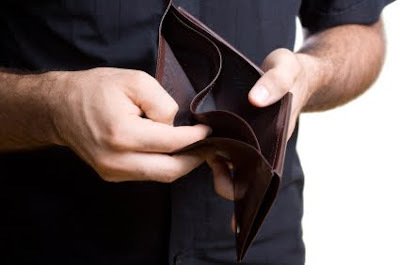 Some things to be thankful for: being broke, but not that broke, and wanting our friends to think well of us, but not that desperately. political ties, dedicated to family, friends, food and gratitude. Wherever you spend it, I hope you enjoy your day. Divinipotent Daily will be back Monday. 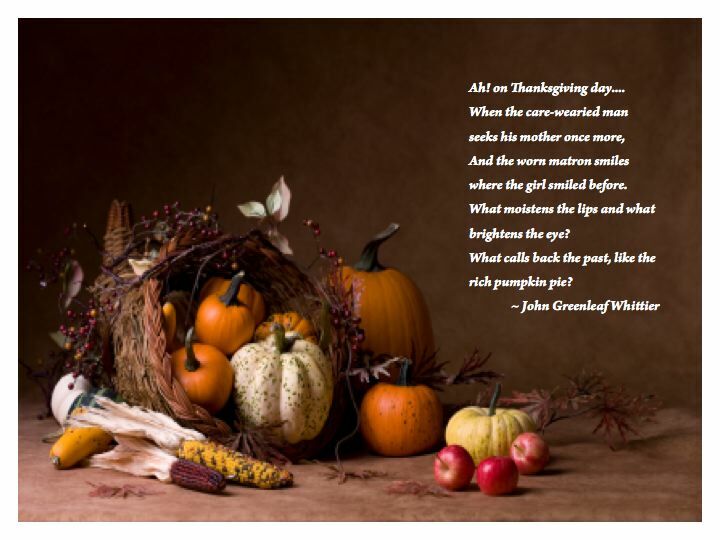 "The funny thing about Thanksgiving, or any huge meal, is that you spend 12 hours shopping for it and then chopping and cooking and braising and blanching. Then it takes 20 minutes to eat it and everybody sort of sits around in a food coma, and then it takes four hours to clean it up." For some people holidays evoke painful memories. Others are lucky enough to have happy ones. Divinipotent Daily is in the latter category, and this is what I remember. When I was a child we lived for a few unforgettable years in a large, sturdy house surrounded by huge trees. It had a circular driveway in front — perfect for roller derby — and a big, landscaped yard in back. The house held three bedrooms plus an Attic of Mysteries on the third floor and four bedrooms on the second floor. It was cramped by today's McMansion standards, but was still large enough to contain our eight-person family and, on holidays, our cousins and second cousins from Virginia. The photo at right shows my parents, sisters and I in the living room of that house. On Thanksgiving day, my mother whirled elegantly through the kitchen (she did everything elegantly) in an apron made by her much-loved Aunt Ella. Her approach to organizing and preparing a meal was practiced and efficient. A typical holiday menu featured large quantities of beans, Brussels sprouts, pearl onions in cream sauce, mashed turnips, mashed potatoes, vast mounds of stuffing, a fresh 25-pound bird, incredibly rich gravy, cranberry sauce, home-made biscuits and wonderful desserts. She was an excellent cook, but the only things she really enjoyed preparing were pancakes in animal shapes, waffles, baked apples and desserts. For holidays, we had buttery, perfectly sugar-and-cinnamon-seasoned apple pie with ultra-flaky crust, tomato soup cake with cream cheese frosting (a favorite allegedly discovered on a Campbell's soup can during WW II) and of course a home-made pumpkin pie with fresh whipped cream. My sisters and I helped where we could — peeling and cubing potatoes, chopping onions and celery, mixing sugar and butter — but this was really mom's show. 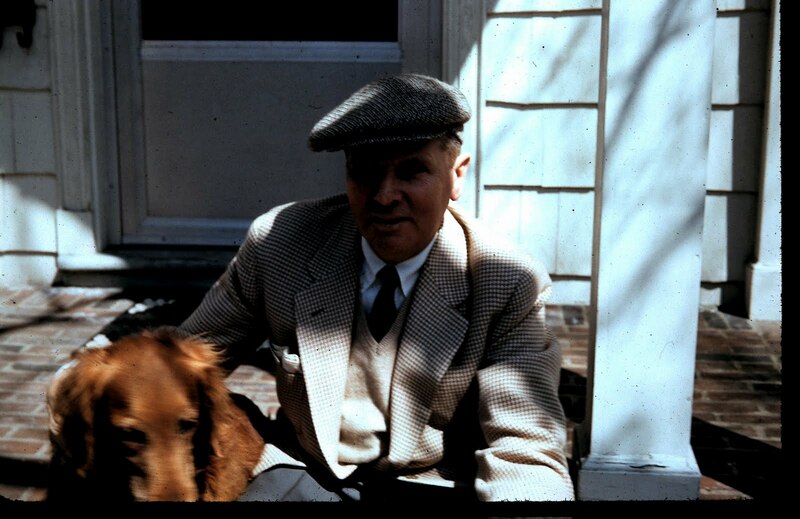 All the while our big, lovable golden retriever (at left with my father) would traipse in and out — never begging, she was too well mannered for that, just getting underfoot — until she was finally banished from the kitchen. The primary job site for the younger generation was the dining room. Assignments included dragging the dining room table toward the hall to make room for every available extra leaf plus a card table at one end; spreading out the linen cloths (solid linen below, lace on top); setting out the candelabras and butter dishes and serving dishes we'd polished the day before; and then carefully working our way around the table with napkins, silverware and glassware, attempting to provide each adult with enough room to actually eat dinner. 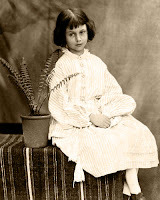 Younger children (of which I was one) always ate in the adjoining breakfast room. This was my favorite room in the house, with greenhouse-like windows and cool, soft green tiles that covered the floor and ran part way up the walls. On average days it was sunny and comforting. On holidays it was a riot waiting to happen. In the afternoon, when aunts, uncles and still more cousins arrived, my father took to the butler's pantry to make drinks and, as the day wore on, attempt to perform sleight-of-hand tricks. Meanwhile, my mother began sending out trays of hors d'oeuvres to moderate the onrushing tipsiness. It never worked. By late afternoon, mother and her sisters Madge, Jo and Allie would be in the kitchen, drinks in hand, Madge and Allie complaining that dinner was late and critiquing mom's cooking techniques. At some point, something would clatter to the floor. Usually it was just a gravy ladle, but one year it was the turkey. Mom and Aunt Madge picked it up, dusted it off and put it on the carving board. No one else ever knew (until now!). At the kids' table, the meal itself was a blur — an odyssey toward dessert that required passage through the Scylla and Charybdis of brussels sprouts and turnips (both of which I eventually learned to love). Long after the kids had left the table and started to clean up, the adults lingered with their wines and liqueurs and brandy. Their voices still echoed up the stairwell well after this young child had gone to bed. This happy period only lasted a few years; my father died at 53 and, of course, everything changed. But the memories remain vividly alive today. Tomorrow, I hope everyone goes out and collects some great memories of their own. "There is one day that is ours. There is one day when all we Americans who are not self-made go back to the old home to eat saleratus biscuits and marvel how much nearer to the porch the old pump looks than it used to. Thanksgiving Day is the one day that is purely American." Perhaps you amaze your friends by wiggling your tongue and ears simultaneously. Or maybe at family get-togethers you're known for putting your legs behind your head and singing the National Anthem backwards. If so, do I have news for you. Today, November 24th, is Celebrate Your Unique Talent Day. "Everybody has at least one thing they truly excel at it. Everyone is truly exception [sic] at something. Flaunt your talent gifts today." Celebrate Your Unique Talent Day is possibly the worst idea for a holiday I have ever come across. While I can't prove it, I am certain it was invented by the same people who want every child, regardless of ability, to make the team and go home with a trophy. Hello, people, life isn't like that. Get over it. "I can shake my eyes left and right really fast!" "I can fall asleep at will." "I can fit 3 quarters into each of my nostrils." "I can lick my ear." Given enough drive, most people with even a modicum of talent can audition to celebrate themselves on one of the "Idol," "Got Talent" or similar shows that have cropped up around the world. Those without drive can simply head to a karaoke bar or, as so many thousands have already done, upload a video to YouTube. Here is my holiday wish: By all means, everyone, celebrate your unique talent today — but please do so in the privacy of your own home. Many years ago I worked for a woman who had a wonderful approach to mistakes. Whenever things went kablooey (a lot) she would say, "I don't care who did it or how it happened. How can we make sure it never happens again?" A new research study by Stamford University and the USC Marshall School of Business reminded me how wise that attitude was. It's no surprise that when one of us points a finger of blame, lots of others are quick to join in. But according to the study, the more public the blaming, the more likely it is to catch on. As Science Daily put it, "Merely observing someone publicly blame an individual in an organization for a problem — even when the target is innocent — greatly increases the odds that the practice of blaming others will spread with the tenacity of the H1N1 flu." And the more blame spreads, the more the workplace cultivates a "culture of fear." The current word for this "blamestorming," but the phenomenon itself is nothing new. It's how blamers from Adolph Hitler to Glenn Beck to mean girls in junior high schools have always controlled their minions. Social Media Today has an interesting, quick-read take on the study here. For a somewhat more in-depth report, see "Shifting Blame Is Socially Contagious" in Science Daily. This Stamford-USC study is behavioral, concerned with how people behave but not why. In my unscentific experience, fear may motivate young children to place blame, but teen and adult blamers are likely to be manipulators trying to gain an advantage. Still to be resolved is the question of what twisted pack instinct leads so many people to second the blame and pile on. Ben Dattner, an organizational psychologist, consultant and adjunct professor at NYU, writes an interactive blog series called "Credit and Blame at Work" for Psychology Today. Perhaps he'll get to it one of these days. Meanwhile, I think I'll borrow a page from my old boss and look for the answer to a different question: How can we stop the blame game in its tracks and make sure it doesn't happen again? "Let us carefully observe those good qualities wherein our enemies excel us; and endeavor to excel them, by avoiding what is faulty, and imitating what is excellent in them." 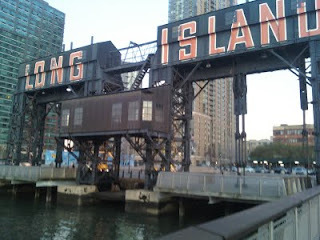 PsyBlog is a Web site and newsletter written by Jeremy Dean, a psychology researcher at University College in London. Earlier this week, PsyBlog's topic was research into "the chameleon effect" — specifically, the theory that we like someone better if they mimic our body language. Scientists are not talking about the exaggerated mimicry of a nine-year-old aggravating his his twelve-year-old sister by copying her every word and gesture. This is about subtler actions — things like concurrent foot waggling, face touching and smiling. Although mimicry is generally unconscious, researchers have tested the chameleon effect by observing what happens when they send people into a room to intentionally mimic strangers in understated ways. The answer seems to be yes, mimicry does increase liking. PsyBlog deals with psychology, but when neuroscientists like V.S. Ramachandran talk about mimicry, they talk about mirror neurons. Mirror neurons are fascinating brain cells that, in monkeys, seem to connect vision to a sort of empathy. Basically, scientists have found that whether a monkey is scratching its chin or watching another monkey scratch, its mirror neurons light up. 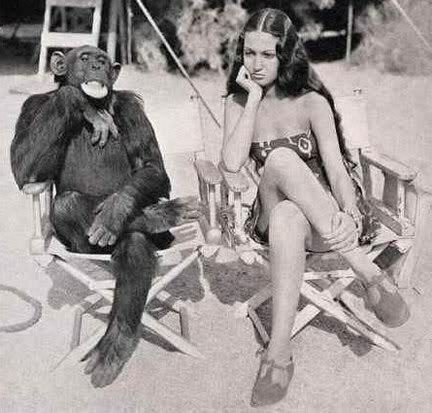 The implication: in monkey society, your itch is my itch. Whether it's mimicry, mirror neurons, peer pressure or some still unknown factor, it's obvious that identifying with others is essential to social understanding and human bonding. Isn't it ironic that we humans, having built a culture based on imitation and homogeneity, claim to worship originality? The stock market is rising, many leading indicators are improving and people are starting to whisper about "recovery." Yet even as the economy expands, jobs continue to contract. Two weeks ago, the Bureau of Labor Statistics announced the unemployment rate had reached 10.2%, the highest since 1983. Meanwhile, unofficial observers speculate that the so-called "true unemployment rate" — which includes the underemployed and those so discouraged that they've given up looking — is closer to 20%. And no one is predicting job expansion any time soon. What's happened to all the jobs? Well, we all know that millions of them have moved overseas in the past few decades. In addition, right here in the U.S., ever since the the mergers-and-acquisitions boom started building steam in the 1980s, Wall Street has been buying up reasonably profitable companies — companies that employed people — and stripping them down to their parts for sale. Use whatever dumb euphemism you like — downsizing or the heinous "right-sizing" — it's still putting massive numbers of people out of work so that a handful can have more money. Speaking of which, we are now stuck firmly in the era of obscenely inflated pay packages for the job-killing geniuses at the top. This chart (courtesy of Wikipedia) makes the latter trend graphically obvious. As many have noted, the top 1% of Americans control 90% of the nation's wealth and have reaped most of the income growth in recent years. 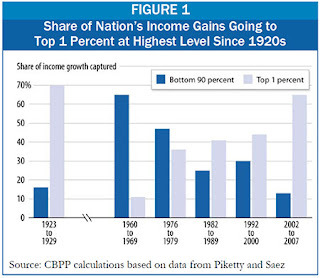 This chart from the Center for Budget and Policy Priorities shows that the share of wealth flowing to the country's wealthiest citizens is now at the highest level since 1929. Last week, New York Times writer Timothy Egan wrote a poignant, stinging piece about the destruction the directors of Anheuser-Busch brought to the people of St. Louis when they chose to fatten their pockets by selling the company; it's called "The Betrayal" and I highly recommend it. With the people at the top taking and keeping so much, is it really any surprise that there is little left to pay for jobs for the rest of us? Yet the financial industry considers the greedy geniuses who destroyed jobs and very nearly destroyed the global economy "indispensable." Here's what I think is indispensable: jobs. These emperors are naked. 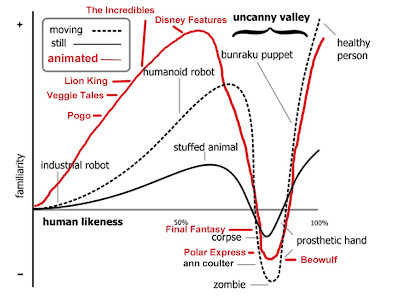 Also entertaining: this YouTube video on the uncanny valley from Popular Science. Although the uncanny valley feeling is familiar to most of us, the term itself has mainly been used by robotics experts. It was coined by one of their number — Japanese roboticist Masahiro Mori — in 1970, when he realized that a robot that looks too human provokes a strong, negative emotional response. Recent research has found that monkeys, too, have the uncanny valley reaction. 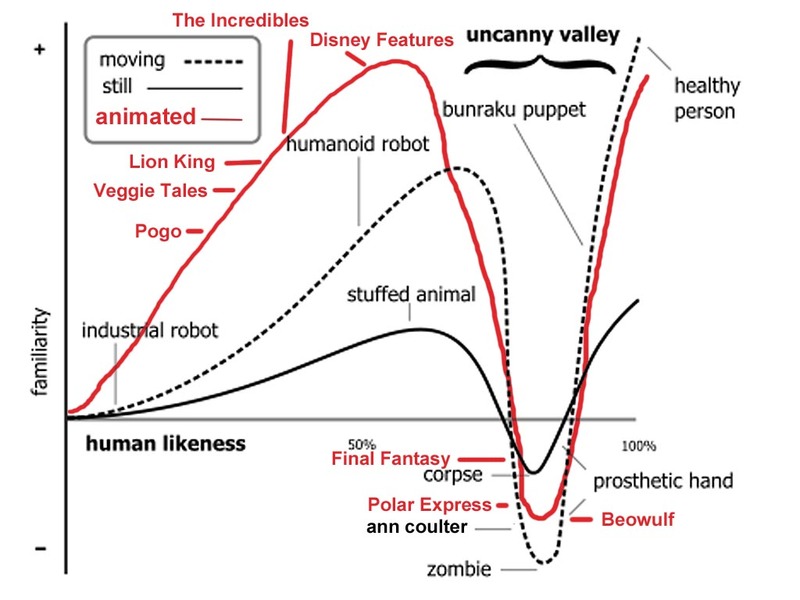 The wonderful uncanny valley chart below, which adds stuffed animals, Disney movies and Ann Coulter to the mix, can be found on the blog of CGI artist Jonathan Joly. "I believe that robots should only have faces if they truly need them." Scientists don't know why we react so negatively to not-quite-human (or not-quite-monkey) objects. Some say it's because they look like zombies — dead but still moving, which obviously isn't right. (Note to self: expect a call from the Zombie Anti-Defamation League.) Some say almost-human objects appear sickly, and the uncanny valley is a protective instinct telling us "run for it — disease is present." Scientists at Princeton Neuroscience Institute, which conducted the monkey study, believe the phenomenon is a biologically based evolutionary adaptation but are not willing to place any bets on its purpose. One of Divinipotent Daily's close friends is an uncanny valley savant. Her response is triggered by a broad range of "just not right" things including statues and people in Mickey Mouse costumes. To my friend's list I would add ventriloquist's dummies, although it could be the ventriloquists themselves who are giving me the creeps. But why stop there? Have you ever been in an extremely familiar place — on a walk through your own neighborhood, maybe — and suddenly sensed that something just wasn't right? Isn't that an uncanny valley? And how about actual humans who give you the creeps (like ventriloquists)? They may not look dead, but something is certainly off. National Geographic has an online article and slide show about Tanzania's Hadza tribe, who continue to live as hunter-gatherers as they have done for perhaps 10,000 years. As they walk among snakes and scorpions and leopards, I'm betting their uncanny valley sense is working overtime. Divinipotent Daily has a new fascination. Expect an uncanny number of updates. 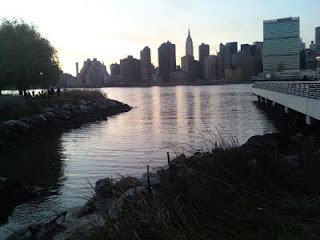 For those of us who live nearby on the Queens side, the East River is a special place that offers tranquility, beauty and minor brushes with nature (Canada Geese, cormorants and occasional ducks, mostly) against a backdrop of the Manhattan skyline. Below are some cell phone shots taken late in the afternoon last Sunday at Gantry Park in Hunter's Point. Once the site of a ferry landing where goods and people traveled back and forth to Manhattan, Gantry Park is now a cluster of piers and parkland that locals enjoy year-round. Drop by some time. "Whenever any American life is taken by another unnecessarily — whether it is done in the name of the law or in defiance of the law...in an attack of violence or in response to violence — the whole nation is degraded." Ever since the execution of D.C. sniper John Allen Muhammad last Wednesday, Divinipotent Daily has been consumed with issues of crime and punishment. Today's will be my last post on the subject (at least for now). No matter where we stand on the death penalty, we are all affected by the larger issue of criminal sentencing. Money and skin color are hugely influential in sentencing decisions; punishments for similar crimes, even for first offenses, vary widely from jurisdiction to jurisdiction and even within jurisdictions. We also see inconsistencies in parole, including the release of violent criminals simply to relieve prison overcrowding. We see false convictions — according to the Death Penalty Information Center, 139 people have been released from death row since 1973. And then there is the tremendously high financial cost of death penalty cases, which is making some states wish they could back away from executions or drastically limit the appeals process (which, given the numbers of innocent people already discovered on death row, would logically lead to the deaths of the wrongly convicted). Euripides would be a lonely man in many parts of the U.S. today. Here and elsewhere, the philosophy of imprisonment is a pendulum that swings from rehabilitation/reform to vengeance/retribution — which is where we are now, with our three strikes laws and executions. Whatever we are doing, we are certainly not deterring violent crime — statistics compiled by the U.S. Department of Justice (see chart) make that clear. Some prominent legal minds are apparently so frustrated by our judicial system's ineffectiveness that they are revisiting more primitive forms of punishment. In 1976, while director of a group called the Committee on Incarceration, legal philosopher and current Cambridge University Professor Andrew Von Hirsch wrote a book called Doing Justice: The Choice of Punishments. The book considered the idea that “just deserts” sentencing — essentially a return to the eye-for-an-eye model of justice — is worth examining as an alternative to arbitrarily long (thus unfair) prison terms. The Committee ultimately rejected the idea for several reasons, including the fact that pain is too subjective to be meted out fairly and, ultimately, "intentional corporal maltreatment evokes in its victim intense feelings of humiliation and terror....Ought a civilized state ever to visit such mortifications?" I would like to believe that most modern humans are repulsed by the idea of government-mandated rapes of rapists, beatings of muggers and amputations of the hands of thieves. For those who find such things barbaric but still crave vengeance, Graeme Newman, a professor at the SUNY Albany’s School of Criminal Justice, advocates a sanitized alternative. The 1995 revision of his book Just and Painful, A Case for the Corporal Punishment of Criminals advocates administering pain via controlled electrical shock treatments as an alternative to official beatings, rapes, mutilations and long prison sentences. The macabre illustration above appears on Professor Newman's section of the SUNY Albany Web site. It's so over the top, it made me wonder if he is playing with us — asking us to face our deepest urges for vengeance, no matter how ugly. Unfortunately, his book indicates he is quite serious. When people try to justify harsh punishment, especially capital punishment, claims about the good of society start flying. For example, a few years ago Utah Republican Sen. Orrin Hatch made without irony the mind-boggling statement that "Capital punishment is our society's recognition of the sanctity of human life." Others who favor physical punishment of criminals argue that it makes crime victims feel avenged and, by some pretzel logic, that means it's good for society. Divinipotent Daily has been a crime victim — held up with a gun to my head and robbed one evening ten or twelve years ago. Did I want these people caught? You bet; I didn't want them doing the same thing to anybody else. But more than anything, I wanted my stuff back. And when I say "my stuff" I mean not only my physical possessions but my sense of safety. 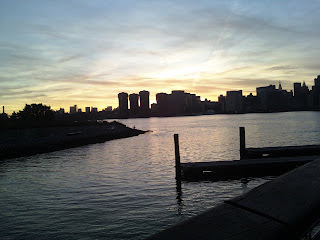 I wanted to feel like I could walk down my own street at 8:45 in the evening without having to look over my shoulder. A restoration to the state of innocence we had before the crime is what every victim really wants, and it's the one thing we can never have. Surely, in 2009, we can think of a better way to exorcise our frustration than by inflicting pain on our victimizers. But let's say we do go back to eye-for-an-eye justice. One of the primary justifications is shorter prison sentences; so, what happens to the rest of us when the criminals are released? We already know quite a bit about the way children react to corporal punishment. To quote a release issued by the American Psychological Association, "Corporal punishment on its own does not teach children right from wrong. Secondly, although it makes children afraid to disobey when parents are present, when parents are not present to administer the punishment those same children will misbehave." While gruesome discussions about punishment continue in the halls of criminal justice, brain scientists are down the road in their laboratories searching for physical indicators of criminal behavior with fMRIs, PET scanners and test tubes. So far, most scientists agree that head trauma, particularly damage to the frontal lobes, correlates strongly with violent behavior. Other theories involve DNA mutations and nutritional deficiencies during key stages of development. All of this obviously raises uncomfortable questions about how responsible certain criminals are for their crimes. Further muddying the conversation is rising awareness that pedophiles, psychopaths and criminal sociopaths seem to continue their criminal ways no matter what type of rehabilitation or retribution they are subjected to. What are we to do with them? Criminal punishment is a huge and disturbing issue, and Divinipotent Daily does not pretend to have answers. However, I do have a question: Given what we now know, and what we are continuing to learn about criminal behavior, isn’t it time that we, as a society, started a serious conversation about crime and punishment? Cooincidentally, the latest post on the wonderful blog Bibliodyssey is titled "Theater of Cruelty." It includes more than twenty illustrations by Richard Verstegan (a/k/a Richard Rowlands), "a Catholic Anglo-Dutch antiquarian, goldsmith and book publisher" who lived from approximately 1548 to 1636. The illustrations depict gruesome tortures that were allegedly visited on unlucky Catholics by their fellow humans over the years. It's a good reminder of what state-sanctioned revenge can look like. The essay I'd planned on posting today — about the impact of brain research on justice and some controversial theories about punishment — needs more research and will appear Monday. Instead, I offer quotes from some very smart people who've spent their lives in courtrooms. "One searches in vain for the execution of any member of the affluent strate of our society." ~ William O. Douglas, former U.S. Supreme Court Justice. "Capital punishment merely allows proponents to convince themselves that they have done something to fight crime. It is a mirage that distracts society from more fruitful, less facile answers. [The application of the death penalty] mostly closely resembles the lottery." "Sometimes, the erroneous assumption is made that opponents of capital punishment are not concerned about victims of crime, or that they somehow denigrate the seriousness of murder. If the execution of murderers is all that can be offered crime victims, maybe it's time to regroup and think a bit harder." "People who are well represented at trial do not get the death penalty...I have yet to see a death case among the dozens coming to the Supreme Court on eve-of-execution stay applications in which the defendant was well represented at trial." "Perhaps the whole business of the retention of the death penalty will seem to the next generation, as it seems to many even now, an anachronism too discordant to be suffered, mocking with grim reproach all our clamorous professions of the sanctity of life." What are we seeking when we want people to die for their crimes? Immediately following the execution of D.C. sniper John Allen Muhammad, the husband of one of his victims told a Washington Post reporter he was glad Muhammad was dead; he said, “I don't have to think about him anymore.” However, that sort of closure seems unlikely; whenever this man thinks of his dead wife, isn’t he likely to remember why she is gone? The same article includes a brief conversation with the brother of another victim. The man spoke of his sadness and clearly recognized that Muhammad’s execution would not bring closure, but then said, “I think it was justice.” Perhaps he's right — but only if we define justice as retribution. Many people, including Divinipotent Daily, believe the death penalty is not about justice, closure or deterrence; it’s about revenge. And let’s be honest: we humans do seem to be vengeful species. But where does this impulse come from and why is it so powerful that it leads to state-sanctioned homicide? An article on the Web site of the American Psychological Association discusses research by Ian McKee, PhD, of Australia’s Adelaide University, who links “vengeful tendencies primarily with two social attitudes: right-wing authoritarianism and social dominance, and the motivational values that underlie those attitudes.” That seems a little extreme, but perhaps McKee's original research (which I have not yet located) adds some necessary nuance. The same article also describes research into “the revenge paradox.” Kevin Carlsmith, PhD, a social psychologist at Colgate University, has found that revenge-seekers often say they’re looking for catharsis — for a release from their rage — but end up feeling angrier than ever once revenge has been exacted. The theory is, people who do not seek revenge minimize the offense and simply get over it. Those who act on vengeful impulses intensify the offense and make it more concrete and, as a result, feel worse. So why does revenge persist? Carlsmith hypothesizes that it’s a way to keep society running. "You're willing to sacrifice your well-being in order to punish someone who misbehaved." Considering these studies side by side, it seems we may be lured into seeking revenge by the promise of a biological reward, but it's a fleeting one. Like eating an overly rich meal, revenge seems like a good idea at the time, but you regret it later. Tomorrow: The impact of brain research on the concepts of right, wrong and justice and some controversial theories about punishment. "Revenge is a kind of wild justice, which the more man's nature runs to, the more ought law to weed it out." The D.C. murders started with revenge — the killing spree is thought to have been an act of rage directed at Muhammad's ex-wife. The abhorrent saga ended with officially sanctioned revenge witnessed by 20 relatives of Muhammad's victims. Divinipotent Daily opposes the death penalty for many reasons. Most obviously, death sentences almost exclusively target the poor and almost never those who can afford good lawyers. But on a more fundamental level, the death sentence appeals to the darkest parts of human nature; it distorts grief and twists it into bloodlust. Research into the psychology of revenge will be Divinipotent Daily's topic for tomorrow. Yesterday my upper lip was involved in a collision with my toddler-age granddaughter's hard little head. It wasn't much of a collision and the pint-sized headbanger is fine. Divinipotent Daily, however, is a different story. Bleeding and bruising come so easily to me that a minor dental procedure can turn into a scene from a slasher movie. 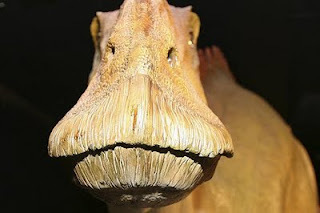 I would like to tell you that this morning I look like a duck-billed dinosaur — they've always seemed rather jaunty to me. The one above is a Brachylophosaurus canadensis named Leonardo who was discovered, mummified, in Montana in 2002. Leonardo has been on tour of late and the story of his stay at the Houston Museum of Natural Science is worth a look, since it includes a film about Leonardo's discovery. But I digress. The truth is, I do not look like Leonardo. The swelling is confined to just one side of my upper lip, making me look more like a half-hearted Angelina Jolie wannabe. A dark bruise that could be mistaken it for dirt or, who knows, five o'clock shadow, is clearly visible. "Lord knows, I never want to waste any more of my time in mirrors." The only recourse is to follow Aristotle's dictum — "The ideal man bears the accidents of life with dignity and grace, making the best of circumstances" — and turn this into a blog topic. Lastly, a note to the great thinkers: a bruise is more than a metaphor. "I have not done what I wanted to, but I tried to make a good fight." 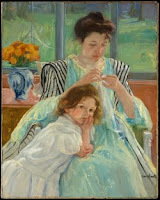 I recall the day when, as a young teenager, I stopped to look at a painting by Mary Cassatt at the Metropolitan Museum of Art in New York and realized I was looking at a painting by a woman. My parents had quite a few art books, but none contained anything like this. In school, we had been taught about the women writers of the 1800s who took male-sounding pseudonyms to be taken seriously (Charlotte and Emily Brontë writing as Currer Bell and Ellis Bell, respectively, and Mary Ann Evans as George Eliot). But women painters, like women composers, simply never came up. "I have had to go to men as sources in my painting because the past has left us so small an inheritance of woman's painting that had widened life.... Before I put a brush to canvas I question, 'Is this mine? Is it all intrinsically of myself? Is it influenced by some idea or some photograph of an idea which I have acquired from some man?'" The Whitney Museum in New York is currently devoting one of its floors to another great woman artist, Georgia O'Keeffe. The show focuses not on the giant, intense flowers, animal bones and Southwestern landscapes most people associate with O'Keeffe, but on the abstractions she created in the very beginning and at the end of her career. O'Keeffe has long been an icon and role model for women who, like me, grew up in the 1960s and '70s and once entertained ideas about living the artist's life. To enter the art world in those days was to walk among chest-beating cavemen. For a woman to be as uncompromisingly herself as Georgia O'Keeffe in that testosterone bath of an environment — 50 years earlier — must have required enormous courage. Not surprisingly, during much of her lifetime, O'Keeffe was dismissed by critics as a lesser artist, someone off the mainstream in a little tributary called female sensuality. "Because we are denied knowledge of our history, we are deprived of standing upon each other's shoulders and building upon each other's hard earned accomplishments. Instead we are condemned to repeat what others have done before us and thus we continually reinvent the wheel." In the mid-1970s feminist and artist Judy Chicago created a controversial, three-dimensional work called "The Dinner Party," which is now a long-term installation at the Brooklyn Museum in New York. "The Dinner Party" was created from materials traditionally associated with women — porcelain, ceramics and embroidered linens. 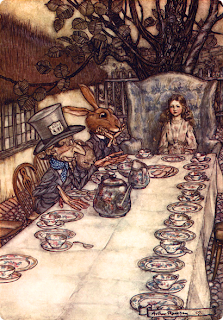 It is controversial because of its intellectual intent and because most of the plates created for "The Dinner Party" depict symbolic, flower-like, three-dimensional vulvas. The point of the piece is to pay tribute to women's contributions throughout history and, in the artist's words, "end the ongoing cycle of omission in which women were written out of the historical record." Women have always created art. 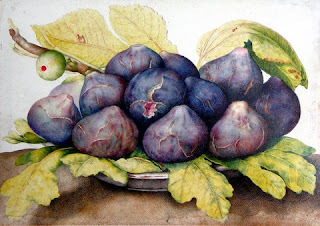 This beautiful plate of figs was painted by Giovanna Garzoni, a woman artist who lived in the 1600s. 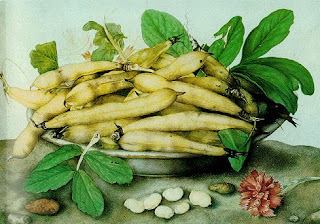 And have a look at this magnificent still life. It's another Garzoni. She was not the first; the historical record now includes women artists starting in Medieval times, but we can assume they have been there all along. We just haven't heard about them because for centuries, the people writing the art history books chose to ignore them. Now, with the help of the Internet, things are finally changing. It is no longer possible to hide women's contributions when more are added daily to the sum of beautiful things to see and explore. "I said to myself, I have things in my head that are not like what anyone has taught me — shapes and ideas so near to me — so natural to my way of being and thinking that it hasn't occurred to me to put them down. I decided to start anew, to strip away what I had been taught." As a child, Divinipotent Daily spent countless, blissful hours tooling around on a Raleigh English racer; it was maroon, a color that seemed indescribably grown up and sophisticated. She currently rides a lovingly reconditioned pre-owned specimen from the fine people of Recycle a Bicycle. Divinipotent Daily is a bicycling fan. Iris Murdoch's observation is true. Bicycles really are civilized conveyances; they are also good for the environment, inexpensive to own and operate, good exercise and fun. But riding a bike on city streets is another matter. 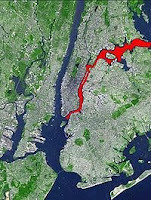 Statistics collected by the NYC Department of Transportation show that the number of bicycle riders in New York City rose 35% between 2007 and 2008. While bike riding in U.S. cities does not yet approach the two-wheeled traffic in other parts of the world, given worries about the environment and rising fuel costs, similar or greater increases across the U.S. would not be surprising. But bicycles in big cities are surrounded by cars driven by people driven mad by traffic. If there are bike lanes, a bicyclist is likely to find cars there, sometimes parked there. Other common road hazards include cars making right turns without looking or signaling and cars arrogantly sideswiping bicyclists and running them into the gutter. Cars also swing their doors open unexpectedly, forcing riders to choose between slamming into the protruding door or swerving into traffic. The other day the wonderful BoingBoing.net, a compendium of the most interesting and peculiar things on the Internet, posted an item about a Bicycle Defense Kit that fits in an Altoids box. Clearly created by an enraged bike rider, it includes "citizen citations," stickers saying "I was a jerk to a cyclist" and a variety of guerrilla warfare weapons including stink bombs and valve stem cutters. Perhaps it's not the wisest approach, but it is understandable as an expression of frustration. The bicycle's passenger-engine is of course what William Burroughs called "the soft machine" — a living, breathing human. And bike-riding humans are also part of the problem in urban areas. 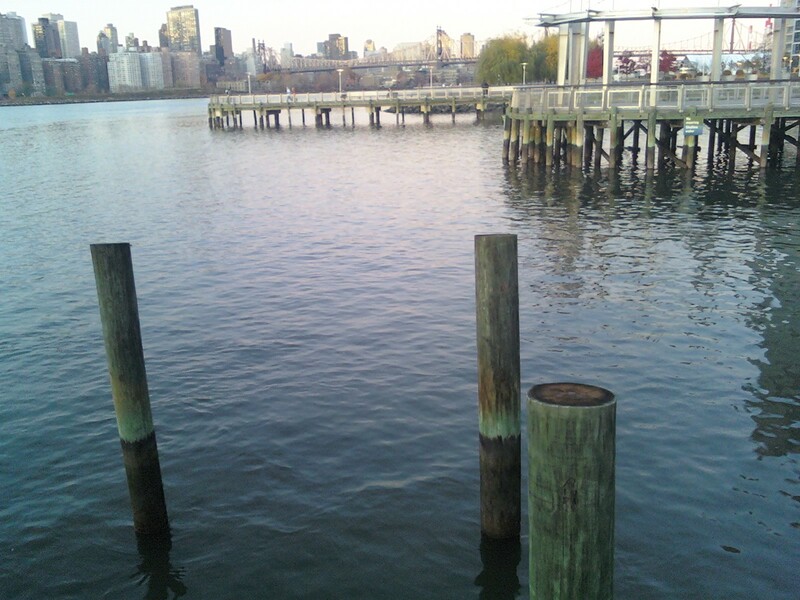 New York City may be a special case, but most local bike riders don't follow any discernible rules. In fact, most seem unaware that rules for bike riding even exist, and that makes them dangerous. It's not unusual to see bikes riding three and four abreast. Nobody uses hand signals. Nobody waits for lights or stops at stop signs. Riders drive the wrong way on one-way streets, loop slowly from side to side when surrounded by traffic, slide in between cars on congested streets and speed through occupied crosswalks, sometimes colliding with pedestrians. The fact that most New Yorkers have never laid eyes on the city's "Bicycle Rules and Regulations" pamphlet, which is not available in bike stores and is impossible to find on the city's otherwise helpful Bicycle Information site, certainly isn't helping. The site does trumpet the construction of 200 miles of new bike lanes, offers a whole page on bike safety, notes the installation of new, temporary "art" bike racks designed by biking enthusiast David Byrne and even provides a map of where to see them. Divinipotent Daily is one of the few people to actually possess a copy of "Bicycle Rules and Regulations." (If you would like one of your own, send an email to Ageblind@gmail.com.) Only four pages long, it is one of the least intuitive, most visually off-putting, least user-friendly publications a person is likely to come across. A jumble of randomly organized information, it offers not one visual clue as to what is important. In Divinipotent Daily's dreams, some caring bicycle manufacturer will hire a writer-designer team — or David Byrne! — to rethink and redesign the wretched document and then distribute copies to every bicycle shop in the metropolitan area. 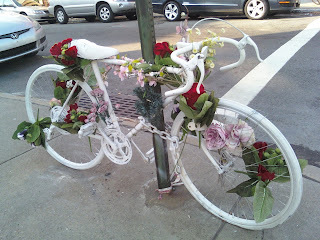 This is a photo of a Ghost Bike, a permanent memorial to someone who died while bicycling. This particular bike is in Greenpoint, Brooklyn, but similar bikes can be found all over the city. According to New York magazine, they're turning up in other cities as well. Let's hope that with a little bit of education, drivers and bike riders will share the roads with mutual respect, and Ghost Bikes will become a thing of the past. "Fairy tales can come true, it can happen to you." ~ Carolyn Leigh and Johnny Richards, "Young at Heart"
Most classic children's stories are written with a lesson in mind — stay away from trolls, when visiting grandma check her teeth, beware of people in gingerbread houses. But other stories are more philosophical. 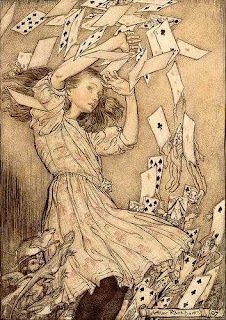 Today Divinipotent Daily invites you to get into the Zen zone and ponder some thoughts from the stories Lewis Carroll wrote to entertain Miss Alice Liddell, along with a random sampling of the extraordinary artwork Arthur Rackham created to illustrate them. 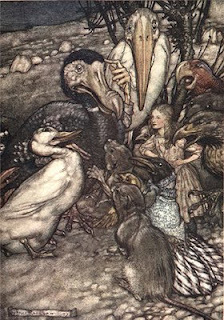 "But I don't want to go among mad people," said Alice." Oh, you can't help that," said the cat. "We're all mad here." "Begin at the beginning and go on till you come to the end; then stop." Divinipotent Daily has noticed a peculiar trend lately — drivers who pull up to red lights, stop briefly and then proceed on through. This is happening in broad daylight in New York City, not in the middle of the badlands of South Dakota. A growing number of people apparently consider themselves exempt from the traffic rules the rest of us must follow. This brought to mind another trend. 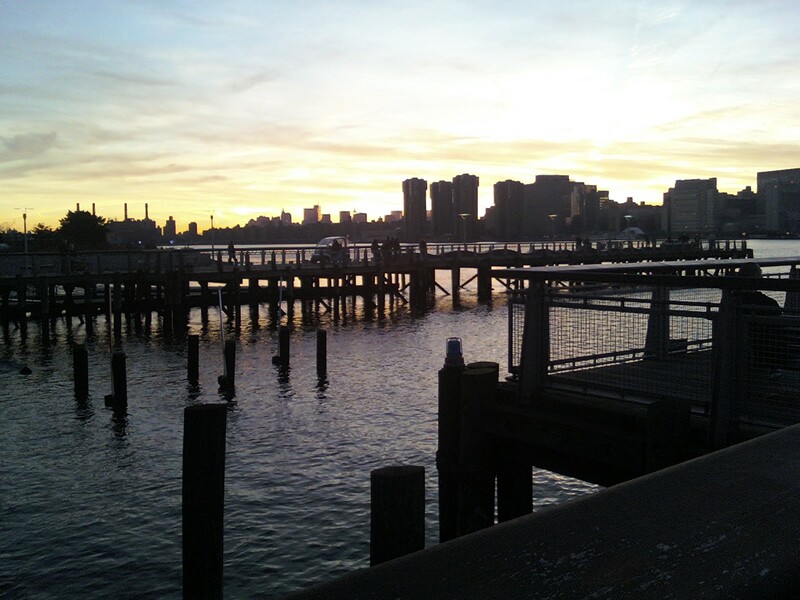 Here in the home of Wall Street, when the global economy first hit the skids it was common to see expensive European cars hurtling down the Long Island Expressway at breathtaking speeds, weaving in and out of traffic with inches to spare. Divinipotent Daily wondered whether the financial sector's mass despair had soaked itself in rage and gone for a spin, turning investment bankers into four-wheeled missiles. "Stupidity combined with arrogance and a huge ego will get you a long way." But that's not the worst of it. Last July, drunken mother Diane Schuler got behind the wheel of a minivan filled with children and drove the wrong way down the Taconic Parkway, killing eight people. Just last month, another mother went for a drunken drive with seven young girls onboard and flipped the car, killing one child and sending the others to the hospital; survivors reported that she taunted the children about the odds of having an accident just before the crash. Last month, at his New Yorker Festival talk, Malcolm Gladwell discussed drunkeness. He said the common belief that alcohol lowers inhibitions is incorrect. Instead, studies show that excessive drinking makes people focus on what is immediate and close at hand and, as a result, lose sight of longer range consequences. With or without alcohol, the drivers described above seem focused on one thing only: their right to do whatever they choose. Divinipotent Daily wonders if they might be connected by some shared psychological dysfunction. Is it possible that road rage has mutated into road arrogance, and we are now sharing our highways and neighborhood streets with imperious, self-important egoists who consider themselves immune not only to human laws but the laws of physics as well? Perhaps someone will launch a study. However, the concurrent increase in the popularity of toxic sociopath Ayn Rand does make one wonder. 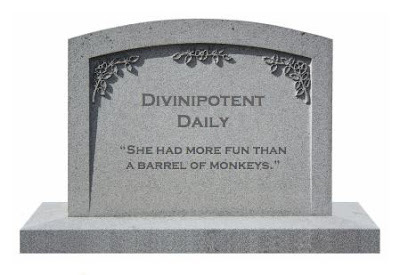 Divinipotent Daily is pleased as Punch, which is to say she is as pleased as a psychopathic killer puppet. And who could be more pleased than that? The reason for this clam-like happiness: the Internet holiday authorities point out it's not only Election Day in the U.S. — it's Cliché Day! (Interesting coincidence, that.) To give this occasion its due, Divinipotent Daily plans to wake up, smell the coffee and go out and have more fun than a barrel of monkeys. Since monkeys in a barrel surely have less fun than, say, monkeys swinging through the trees, this goal is within reach. Hooray! Some people — we're talking about you, Wolcott Gibbs — have chips on their shoulders about clichés. 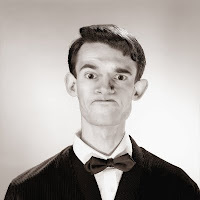 Divinipotent Daily believes that sort of elitist attitude just won't cut the mustard — and since mustard cuts like butter when the butter has been left out in a warm place for an hour or two, that should be considered quite an indictment. 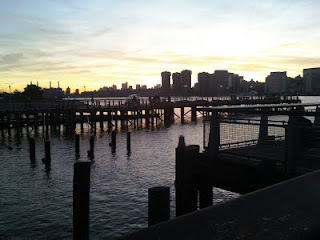 Some years ago Divinipotent Daily's favorite editor, let's call her Prudence, told her a story about seeing a Broadway production of a Shakespeare classic with a middle-aged man who had lost his mind and his young trophy wife ("The TW"). 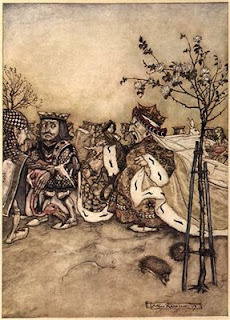 The play was The TW's first brush with the Bard, and when it ended, everyone asked her what she thought. Her response: "The acting was good, but there were way too many clichés." Prudence wanted to read The TW the riot act, but ultimately decided that silence was golden. But we digress. The great English author Evelyn Waugh maintained that "to be oversensitive about clichés is like being oversensitive about table manners." Most people in today's United States have never even seen table manners outside of an old movie where people with butlers hold formal dinners, or perhaps this educational film from the 1950s. Doesn't the taboo about clichés deserve equal treatment? "Last, but not least, avoid cliches like the plague." "You need clichés. Clichés are what people respond to." As Divinipotent Daily was writing this her friend and fellow writer Mary Ghiorsi, a cliché savant, pointed out that the phrase "Just because it's a cliché doesn't mean it isn't true" has become a cliché itself, and then added, "that is so meta." Yes, it certainly is. Last but not least — many thanks to the wonderful Web site known as The Phrase Finder, without which this post would be little more than a twinkle in Divinipotent Daily's eye. A sad fact of life: As you grow older your friends and relatives grow older, too. As a result, even if you are healthy, you spend more and more time in hospitals. And the more time you spend there, the more you realize what strange places they are. Hospitals house two simultaneous, conflicting realities. For patients and their loved ones, hospitals are places of crisis, with all the drama, heightened emotions and tunnel vision crises create. A normally kind and caring person may be a little less so in a hospital. A demanding, selfish or controlling person will be a nightmare. Meanwhile, to doctors and nurses and other trained staff, hospitals are like NASA on launch day: professionals are calmly going about the business of making life and death decisions. "Hospitals, like airports and supermarkets, only pretend to be open nights and weekends." A hospital at night is far eerier than any haunted house. The lights are dimmed and the soundtrack consists of muffled televisions, beeping and clicking machines, the moans of people in pain and the occasional clatter of carts and staff racing to an unlucky patient's room. And those are just the expected atmospherics. Some years ago, while staying overnight with a sick child in one of New York's best known hospitals, Divinipotent Daily was not at all pleased to see mice racing around the halls and across the countertops of the patient kitchen. This is when a hospital begins to resemble the frenetic and hilarious 1971 Paddy Chayefsky film, The Hospital, where a serial killer stalks the darkened corridors. Some hospitals are so understaffed, so filled with stressed out, angry people, that you fear to leave your loved one there. The worst of the worst in this visitor's experience was the geriatric unit of a major suburban hospital. Located out of the sight of the main hospital, the geriatric building was a warehouse for the elderly and helpless that might have been modeled on an inner ring of hell. Room after room contained patients who were totally unable to care for themselves. Many had dementia, most were incontinent, all were severely ill. And yet the hospital had allocated only one nurse and one aid for an entire floor. It was no surprise when a month or two later the hospital lost its formerly glowing rating. "A doctor, like anyone else who has to deal with human beings, each of them unique, cannot be a scientist; he is either, like the surgeon, a craftsman, or, like the physician and the psychologist, an artist. This means that in order to be a good doctor a man must also have a good character, that is to say, whatever weaknesses and foibles he may have, he must love his fellow human beings in the concrete and desire their good before his own."